The Turner movement started in the United States in 1848 in Cincinnati. The first Turner organization in Wisconsin was in Milwaukee in 1853, just seven years before Watertown's was formed. The old opera house had housed many notable events and famous personages who came here to appear before the public. Joseph Jefferson, the celebrated America actor, appeared there, as did Charles Grapewin, who later became an outstanding motion picture actor. Col. Robert G, Ingersoll, the agnostic (some called him atheist) lectured there, as did Col Henry Watterson, famous editor of the Louisville Courier-Journal, and others. Many celebrated American politicians and orators gave speeches there during campaigns. Carl Schurz and Fighting Robert M. LaFollette, Sr., spoke there several times. 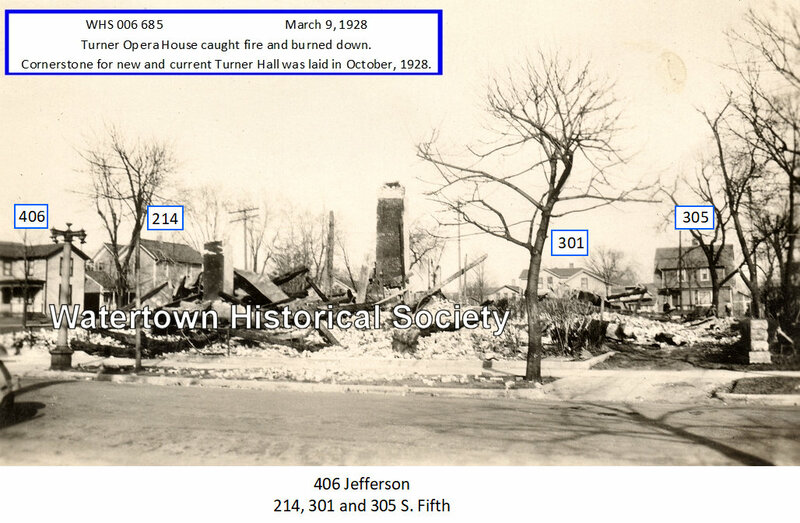 Then on March 9, 1928 fire destroyed the Turner Opera house and with it old records and equipment. 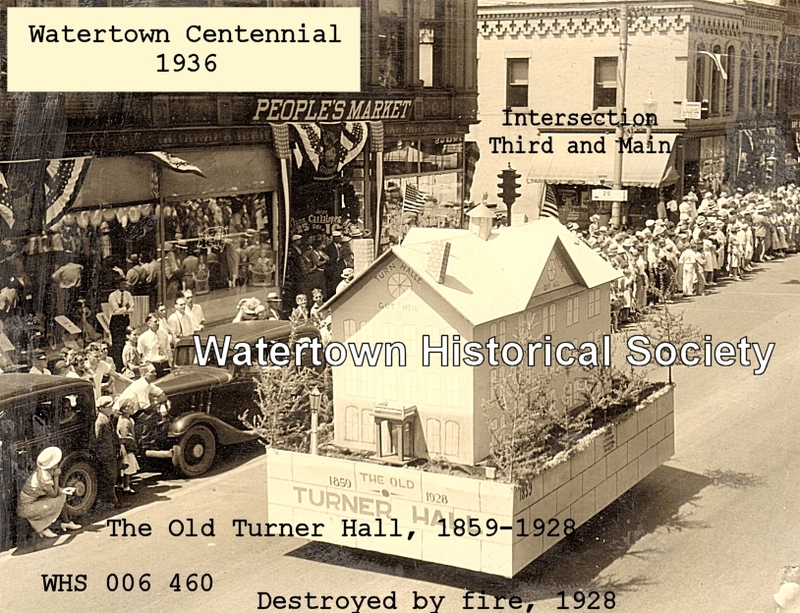 If Watertown's Turner Hall and its predecessor, the old Turner Opera House, could speak they would relate a most interesting series of events which they housed, from great plays to modern dances, conventions, union meetings, mask balls, political rallies, wrestling matches and home shows. 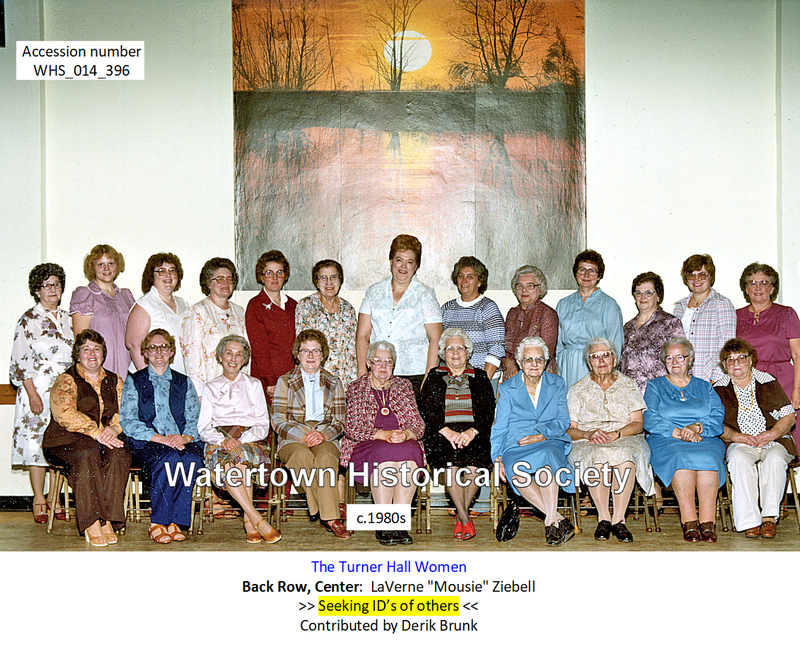 The Turner Hall has been a virtual community center in Watertown. The Turner movement was launched here in 1860 with the organization of a group for the purpose of learning and teaching gymnastics, promoting physical improvement and also to promote musical and theatrical performances and general cultivation of the fine arts and sciences. The first meeting of the Watertown Gymnastic Association, the formal name of the group, was held on Aug. 21, 1860. It was held at Charles Watson's saloon, which was located near the present Plattdeutscher Hall. The purpose of the organization as set forth at the time it was started has been carried on through the years. In addition to the members, many young people of the city have attended classes. 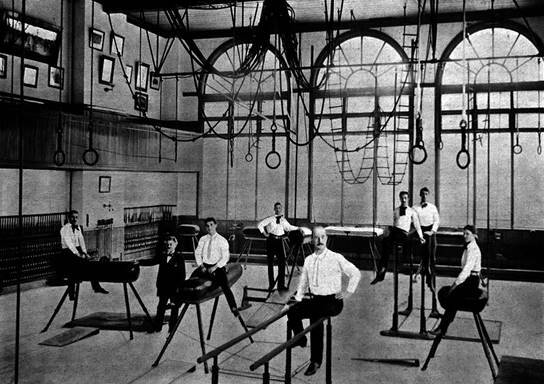 In the early days of the association many of the young men of the community who later became leaders in business and the city's community life were pupils in the "turning" classes which were held in the gymnasium of the hall. In earlier days gymnastic exhibitions, theatrical performances, such as home talent plays given by members, were in great vogue and were much enjoyed by the many large audiences that gathered for each of the programs. Later traveling troupes were booked, some of them playing a solid week locally with a change of program nightly. 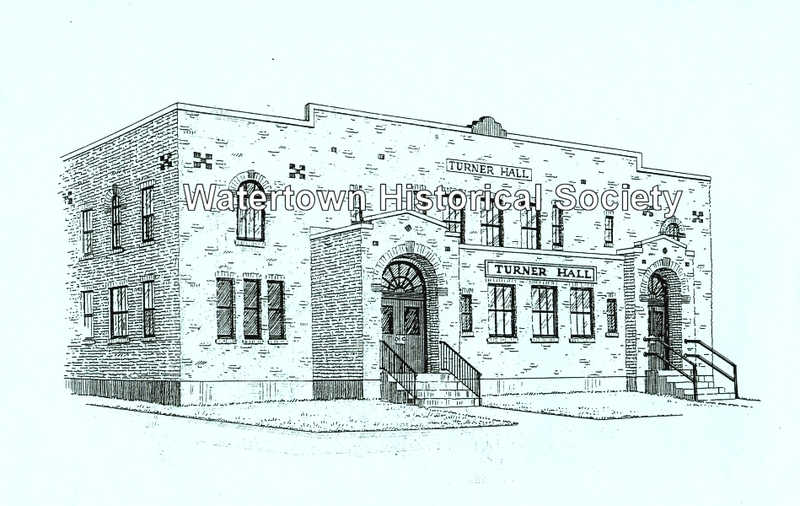 In the days of the waltz and two-step public dances were given as many as three and four times a week and the Turner hall served as the community center of an earlier Watertown. 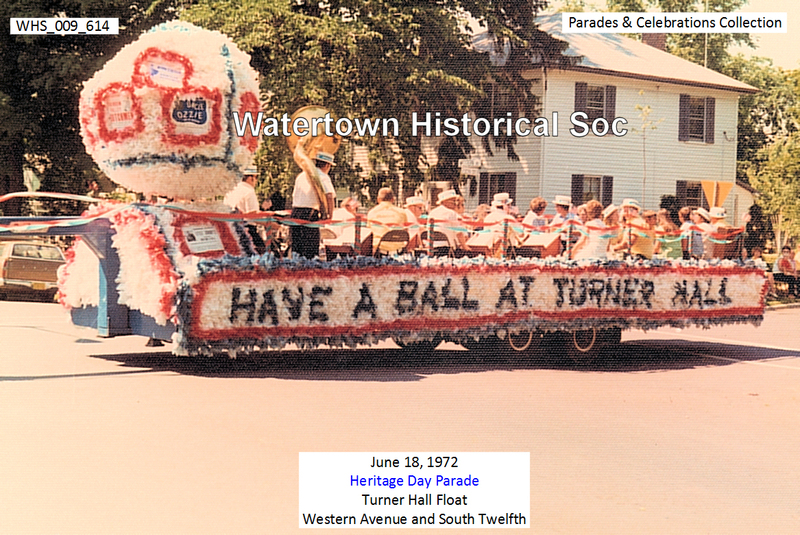 The ceremonies of the celebration were gotten up mostly under the auspices of the patriotic German Turners of Watertown. A handsome grove near the residence of Mr. Enos had been selected as the spot where the people were to assemble to hear the oration, and to this place the procession of Turners and citizens marched . . .
July 4 marked the 100 years from July 4, 1776, when the unanimous Declaration of Independence was signed by 13 states at the Continental Congress in Philadelphia. A parade was the topic of conversation for miles. With Emma Charboneau, the Goddess of Liberty, on the lead float, the parade started at old Turner Hall, moved to Cady Street, then back across the bridge to Main Street and thence to Richard's Grove. The Centennial celebration began at sunrise with music by three bands. Luther Cole was president and orator for the day. Charles Salick led one section of the parade on horseback and Herman Bentheimer of the town of Emmet drove a pair of oxen, to indicate the mode of travel when the Declaration of Independence was signed. Marching soldiers wore Continental uniforms. There was fun for thousands, ending with a fireworks display. The first telephone was installed in 1877 by photographer John B. May, the line running from his office on Main Street to Turner Hall. The Turners will celebrate the 19th anniversary of their organization as a society [in Watertown], on Sunday, the 17th of next month. A picnic will be held in the park during the day, and in the evening a dance will take place in the hall. WD In 1948 the U.S. Post Office issued a 3-cent commemorative stamp marking the 100th anniversary of the movement in the United States. 05 21 A grand May ball is to be held Saturday evening at Turner Hall by the ladies of the Turner Society. The finest dressed lady present will be crowned May Queen. Admission, gents, 50 cents; ladles, free. The Old Lindon House Barn with all its contents totally consumed [not same as Tremont House fire, which occurred on 09 11 1895]; James Casey’s Warehouse burned to the ground; Conley’s Saloon slightly damaged and several other places badly scorched. An attempt to set Turner Hall on fire. Walking through our beautiful park this morning my thoughts ran thusly: What a fine thing it would be, to see this park unfold itself into here and there a flowerbed; here a verbena, there a pansy, and then a tube rose, and so on. A foliage bed in the center with some tall ornamental plant in the midst of it, and so sloping down to the edge, would be exceedingly becoming. And then the thought - let’s do it — it is just the proper thing to do. So then I call on all who are like-minded to come together in the park Saturday, May 24th at 9 o'clock a.m., and bring with you a growing plant of the flowering kind, and before noon we will have the park all glorified and beautiful to behold. Bring along your picnic basket and invite your husband and son. We will make them welcome in their working suits, serve them lunch promptly at 12 p.m., and dismiss them in time for the circus. Come one, come all; fathers, mothers, children, all with a flower. Other wards not excluded if they feel inclined to come. Monday evening the Watertown Chorale Union made its initial appearance in concert and a signal triumph in every particular was achieved. Nothing but unqualified success marked the debut. The strains of the orchestral introduction sounded. Turner Opera house was completely filled by as fine and large an assemblage as it ever contained. The best classes of town people were in attendance, together with splendid delegations from Oconomowoc, Columbus, Fort Atkinson, Jefferson and other neighboring places. The receipts of the house reached about $600 and notwithstanding the enormous expense of the production the union reaped a handsome surplus. An eight-foot board fence, with advertisements of business houses thereon, is to be erected by the Turner Society around its park in the First ward. That great pastime of the "colored aristocracy" - the cake-walk - was much in evidence at the Turner Opera House Saturday night, when was held the annual masquerade ball of the Turner Society. It was of different grades of quality good, bad, indifferent but it nevertheless provided genuine amusement for the throng of spectators who filled the large hall. There were considerably more maskers than a year ago, and taken all together the ball was a great success. The stage features were well conceived and carried out with precision under the able direction of Paul Thom. One of the numbers was a cake-walk in which several well-known citizens competed, the prize being awarded by vote of the spectators to Ed Schultz and Mrs. G. Glaser. 05 30 Lewis Monument dedication participant. Bear in mind that the grand masquerade of the Turner Society, February 24. The program will include rubber neck giants, a Spanish castmette dance by sixteen people, a large caterpillar turning into twelve beautiful butterflies who perform a fancy dance, Prince and Princess Carnival and court, and many other interesting features. 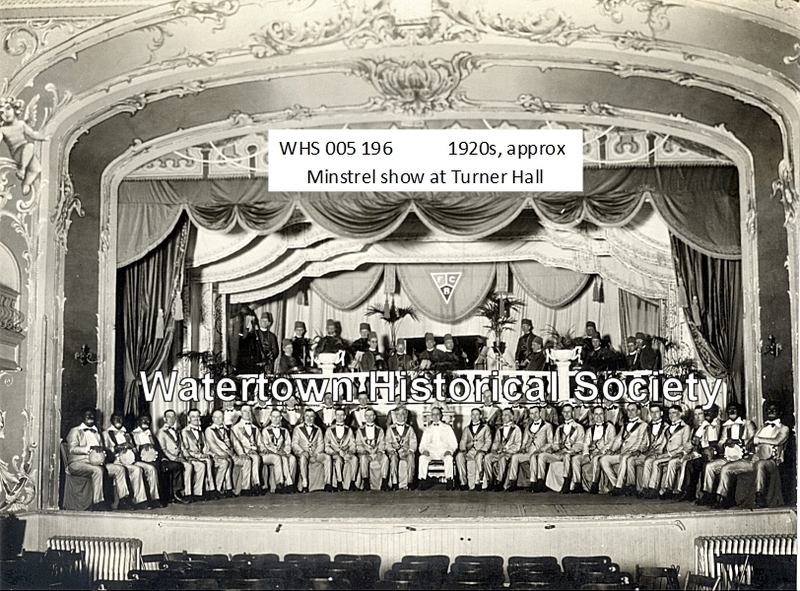 Turner Opera House was well filled with people Thursday evening of last week to witness the entertainment given by the Watertown Dramatic Club, and the Amateur Musical Club, assisted in vocal numbers by Miss Lula Bertram, and Wm. Sproesser. Edw. L. Schempf directed the musical part of the program in his customary efficient manner. The music furnished was high-class and was most excellently rendered. The singing of Miss Bertram and Mr. Sproesser was very much appreciated, both responding to enthusiastic encores. Miss Lydia Pease accompanied the former, and the latter was accompanied by his wife. Common Council: Resolved, That the Watertown Electric Company keep burning the electric arc lamp now placed in front of the Turner hall the same nights and length of time that the other city electric arc lamps burn throughout the year, and that said company be paid for so doing twelve dollars ($12.00) per year in addition to the money paid for street lights annually. 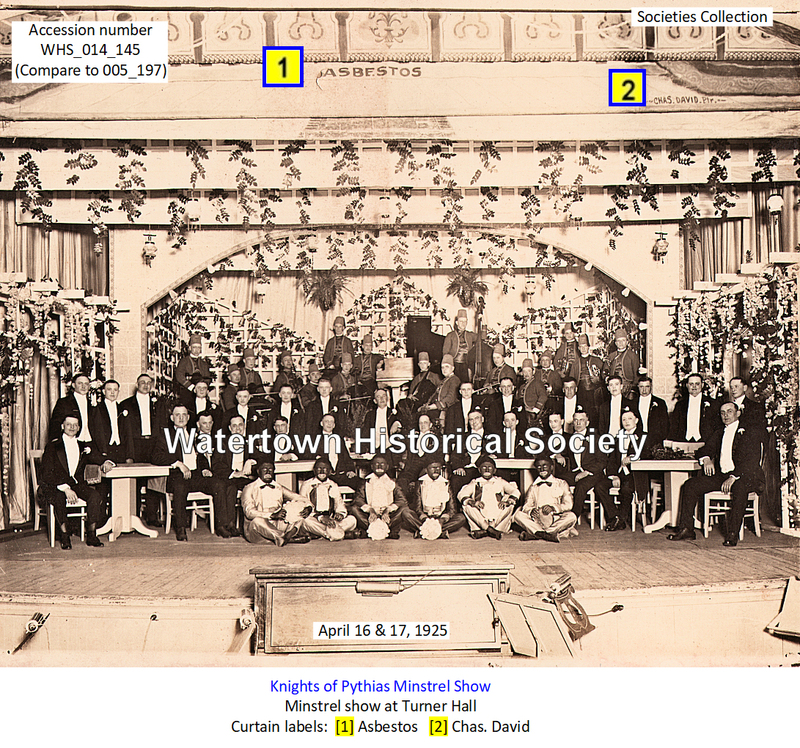 Cross reference note: In 1903 William Bethke organized the Watertown Philharmonic Orchestra. The management of the Turner opera house was unfortunate in booking the musical farce comedy - “Taming a Husband,” which appeared at that place Thursday evening. It was certainly the worst kind of a farce from beginning to end, so much so, that it was a comedy of idiocy. The aggregation could neither sing nor act, and there was nothing in the plot and the small audience, which should have been much smaller, soon tired of the farce, for it was such in fact. The management was not to blame for it came highly recommended and was booked as a first-class attraction and reliance was placed upon the representations made. There is one thing in connection with the play that deserves condemnation and that was the hissing indulged in by some in the audience. If they were dissatisfied they should have retired and not have disturbed those who desired to remain and suffer the agony of which they were the victims. Pictured: M. Koenig, Art Goeldner, Otto Kohls, James O'Brien, William Asmus, William Streich, Henry Moser, William Kuetser, and Bill Korgrest. August The old Turner Opera House, as the predecessor of the present hall was known, was one of the busy places here and the Turners were an energetic and busy lot, working toward clearing the debt on the building. This was finally accomplished with a mortgage burning ceremony held in August of 1910. Vice President — Carl Block. Corresponding Secretary — Archie Erickson. First Treasurer — Edward Specht. Second Treasurer — Ernst Peters. Turning Teacher — Arthur Ullrich. Theatre Director — William Grossert. Theatrical Manager — Joseph Glaus. A mass meeting of citizens is called to meet in Turner Opera, under the auspices of the German-American Club of Watertown. Neutrality in the present European war will be the subject. 01 14 “Birth of A Nation” moving picture shown at Turner. Singer’s Voice put in Comparison With Re-Creation. Saturday evening was the date of the Helen Clark recital at the Turner Opera House, Watertown, when, by previous arrangement, the well-known mezzosoprano consented to sing with the Edison phonograph allowing her voice to be compared with the laboratory recreation of the wizard’s perfected instrument, the most severe test to which any mechanical tone reproducer was ever subjected. The curious, the critical and the skeptical were there. All came away convinced that Edison recreation is as nearly like the original voice as could possibly be imagined. Every test was greeted with hearty applause from the great audience which packed the Turner to the doors. The recital was not only a revelation but a rare musical treat as well. Miss Clark sang in unison with her own voice. Some of the numbers were “Face to Face” by Johnson; “Nightingale Song” by Keller; “For You” by Montague and “Bells of Lee” by Adams. Except perhaps for the difference in the volume of the tone, one could not be sure when Miss Clark sang and when she did not. It is true, her lips could be watched, but some of those who sat close to the stage are quite sure that at times Miss Clark formed words with her lips but in singing of “Bells of Lee” the lights went out. The volume of tone increased materially at the end. Perhaps the majority of the audience believe that Miss Clark was adding her voice to that of the instrument, but when the lights flashed on again, she was not upon the stage. Special thanks to Leonard Kottwitz for his help in providing much of the research for this article. 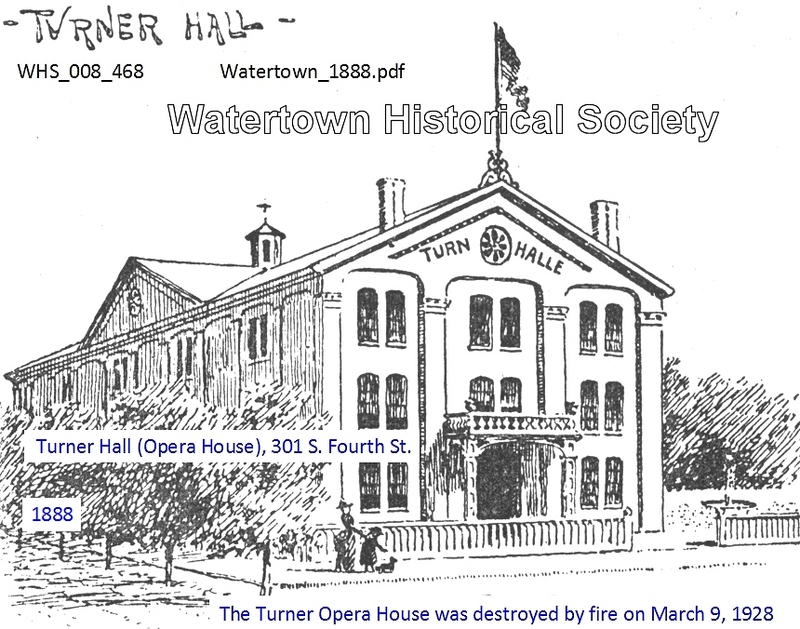 It was a sad day in Watertown, when, on March 9, 1928, Turner Opera House caught fire and burned down. Not only did the Turners lose their entire facility, but a performing show lost $10,000 worth of equipment and the National Guard, which was headquartered there, suffered another $10,000 loss of weapons and a huge arsenal of ammunition. The wintry setting helped prevent the fire from spreading off-site, but it did not minimize the spectacle of Watertown's oldest building being ushered into history by a rising crescendo of exploding-shells. The fire swept through the building just hours after the annual meeting of the organization had concluded. A $19,000 insurance payment helped meet the cost of rebuilding. The cornerstone for the new, and current Turner Hall was laid in October, 1928, with the grand opening the following January. Amazingly, the entire structure cost only $54,000 to build. 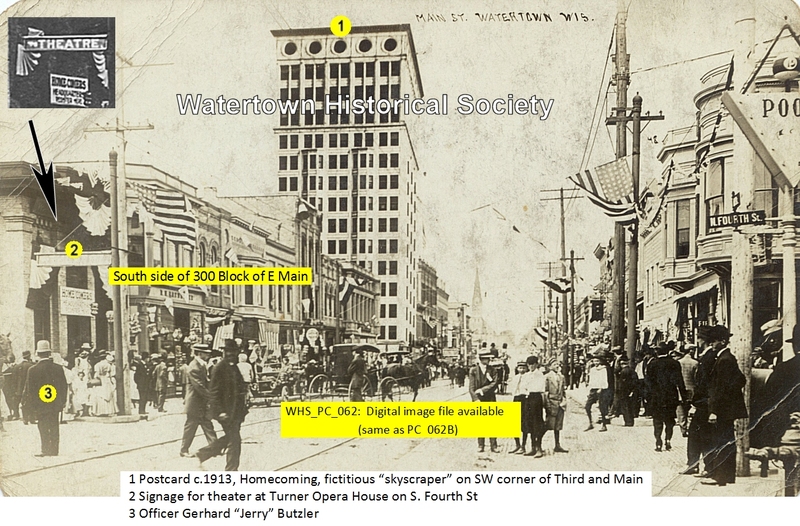 The Watertown Historical Society has a set of images of the 1928 fire. Completion of the building ushered in the era of basketball in the main hall, professional wrestling matches on Friday evenings and Sunday night dances. As the years went by the Turners found it more and more difficult to compete with other halls and businesses that offered large group facilities. A primary reason was the lack of a liquor license. Up to that time, the Turners had a license to sell beer, but did not have a license to sell hard liquor. It was a long and difficult fight but matters finally came to a head in 1965 when the Turners announced the facility would be closed and the building sold unless a liquor license was granted. The Watertown Common Council relented and a liquor license was granted. With that new beginning, the Turners continued to enjoy tremendous success in fulfilling their historic purpose. 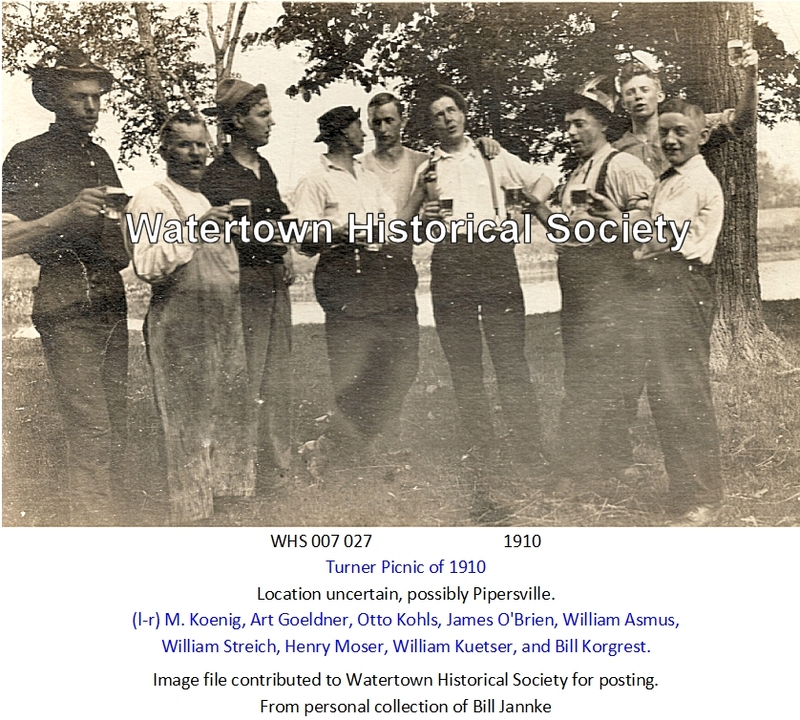 In the 138 years since their founding, the Turners' organization has been an inseparable part of Watertown's progress and history. While it is easy to focus on the beautiful landmark that has been the center of their activity, it is the Turners themselves that have made the greatest mark for good in the community. "O Lord, we pray that Thou woulds't continue to make this Christian organization a blessing to the community and to all men. Christian fellowship and wholesome Christian recreation is also a blessing. Enable us as members of the Christian organization to continue to live in love and in harmony one with another. Make us all mindful of what love means in an organization. As we thank Thee this evening for this Christian fellowship, yes, of some 100 years, we are made very mindful of Thy love and what it means to an organization and to a world." The corner stone of the present hall was laid on Oct. 14, 1928. Dedication ceremonies of the present building were held with the opening of the hall on Jan. 29, 1929. Home talent plays are still in vague, but radio shows and talkies have largely replaced the old time stage plays and the waltz and two-step have given way to modern forms of dancing. The present Turner members have worked hard and long toward the goal of clearing the debt on the present building and wiping out the mortgage. Mention the name "Turner Hall" and the first thing that comes to mind may be great fish fries, gymnastics, or the beautiful building that has hosted so many community celebrations and private receptions over the years. But the long and colorful history of the Watertown Gymnastic Association, more commonly known as Watertown Turners, is far richer than the gourmet food they have served for decades. In fact, it is inspiring. The Turner movement began in Europe in the early 1800's, an outgrowth of both lofty ideals as well as practical innovation. It was the era of Napoleon and the empire that he was piecing together encompassed most of western Europe, including the German principalities. While historians have praised his military skills and emphasized his many accomplishments, Napoleon governed as a typical military dictator. Napoleon oppressed freedom everywhere, yet he was especially harsh in the conquered lands. Meetings for any political purpose were banned but it was permitted to gather for athletic activity. So Friedrich Ludwig Jahn, the "father of gymnastics" and a fervent German patriot, began organizing Turnverein (gymnastic clubs) all across Prussia. Jahn believed that physical education was the key to national vitality and equally important in strengthening individual and national character. Members of the gymnastic clubs, which always included large numbers of German youth, would gather after each workout to discuss political goals and their dreams for freedom and justice. After Napoleon was defeated in 1815, the powerful combination of gymnastics and politics continued to influence the next generation of Germans. When the Revolution of 1848 broke out, the prospect of achieving the freedom which had been so commonly discussed at the Turnverein led mand "Turners" to support the revolution. When the revolution was suppressed, those who had supported it were forced to flee and many emigrated to America. Some of the political refugees settled in Wisconsin, and quickly formed Turnverein. However, with freedom in their new land already a reality, Turner Societies broadened their purpose to include the "cultivation and improvement of the faculties of the body and mind of its members and the management of musical and theatrical entertainment for amusement of the society and public as well." 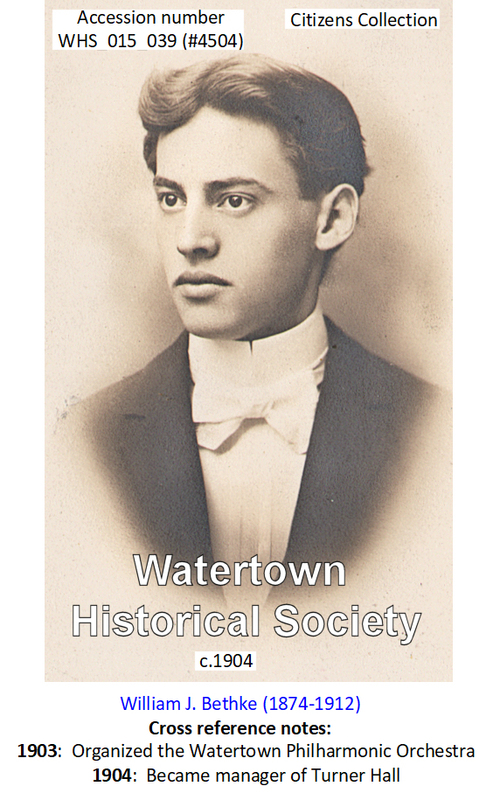 Watertown Turners, originally named the Independent Gymnastic Society of Watertown, was formed on Aug. 21, 1860. Early meetings were held in the old Cole building at the corner of South Second and Main streets (at the location of the former Kline's Department Store). Within a year, the Turners had put on their first theatrical performance. Interestingly, there was a prejudice against theaters in those days. So, to avoid needless criticism, the first Turner Hall was called Turner Opera House. For the same reason, when the Concordia Musical Society purchased the building which is now the Elk's Club, it was called the Concordia Opera House. Whether the performance was a play, musical, or concert, it apparently met with greater acceptability when viewed in an opera house. For 59 years, Turner Opera House was the center of cultural events in the city. The Turners used the building to fulfill their original purposes in the broadest sense - "entertainment for amusement of the society and public." In addition to the theatrical use, the building hosted dances, weddings, conventions, union meetings, political rallies, wrestling matches, and of course, many gymnastic events. 02 23 Cooking school among events at Turner during ’59. 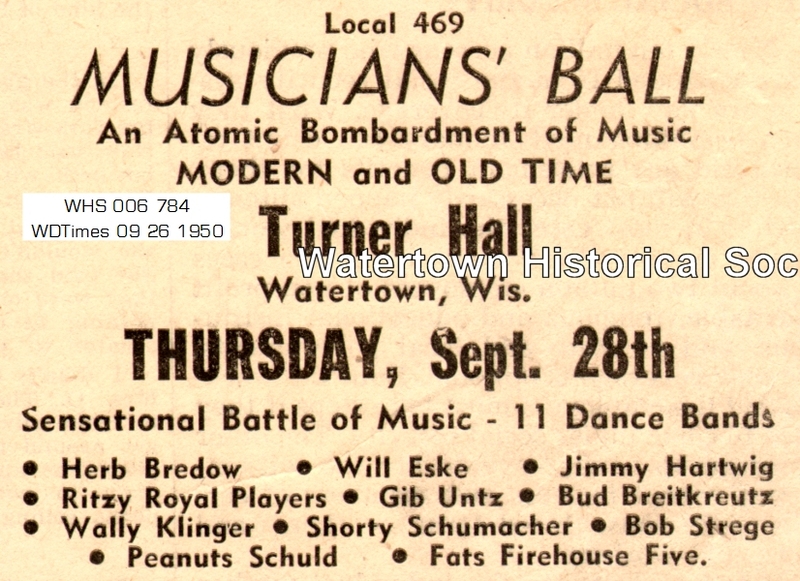 Watertown's First Rock and Roll show there in 1959. MEMORY: There is a slight little "hill" behind the hall. In the 1950's all of us in the neighborhood used to sled there in the winter. . . . Best memories! Also used to go to Turner Hall every New Years Eve! Wayne King, “The Waltz King,” and his famous orchestra at Turner Hall Thursday night, Feb. 6, when they play for a dance. The Watertown Turners today announced results of the annual election of officers. Named were: First speaker, William Ulm; second speaker, Donald Cowan; first secretary, Robert Lischka; second secretary, Edward Zubke; first treasurer, A. A. Ullrich; second treasurer, Wayne Saniter; hall manager, Leonard Kottwitz; gymnastic director, Ronald Bohn; theatrical director, William Kehl. Henry Schaller was appointed publicity director. Various committees are to be named at a future meeting. The Watertown Gymnastic Association last night lost its chances of obtaining a liquor license for Turner Hall from the present common council when the aldermen voted 9 to 5 not to amend one of two ordinances designed to pave the way for granting the license. The amendment to the measure would have changed the section referring to taverns in residential areas. The Wisconsin Department of Revenue determined that the Watertown Gymnastic Association, Inc., Watertown, Wisconsin, does discriminate in its membership on the basis of race and have terminated the income tax exception granted them under Section 71.01(3)(a) of the Wisconsin Statutes. Letter from WI Dept. of Revenue to John Surdick, Watertown City Assessor. Filed in City Assessor Collection with document WHS_013_046 (301 S. Fourth St). An ordinance to rezone property at Turner Hall was tabled Tuesday by the Watertown Common Council to allow the organization to work out a compromise with a neighboring property owner. The Turners have asked for B-2 (business) zoning for 301 S. Fourth St., the location of their existing building, and an adjoining vacant lot at 310 S. Fifth St. The property currently is zoned R-3 (multifamily residential), even though the use has been commercial in nature. The Turners need the rezoning to allow expansion of their building onto the vacant lot. In its recommendation to the council, the planning commission is requiring the rezoning and combining of the two parcels before the expansion can take place. Despite several objections about spot zoning, the Watertown Common Council Tuesday approved business zoning for property owned by the Turners’ organization. The council voted, 6-2, to adopt the second reading of the ordinance, which will change the zoning to downtown business (B-2) on Turner Hall, 301 S. Fourth St., and an adjoining vacant lot at 310 S. Fifth St. The previous zoning classification was multifamily residential (R-3). The zoning change was required by the planning commission to allow the Turners to expand their building upon the vacant lot. The two properties will be combined into one lot as well. The organization wants to increase its kitchen facilities through the project. Watertown Gymnastic Association still resided at Turner Hall. Employees at the Johnsonville Sausage facility in Watertown have been volunteering around the community since a fire in May 2015 shut down meat-processing operations. Most recently employees have been giving Turner Hall a fresh coat of paint. Adolfo Contreras paints trim at the hall and Erasmo Arguijo paints near the ceiling in the upstairs bar. Employees have been working at Turner Hall for about two weeks. Employees have also deep cleaned the kitchen. So far about 60 gallons of paint have been used to paint the walls and ceiling. It’s been about 15 years since the walls at the hall have been painted and the ceiling had been painted for many years before that. 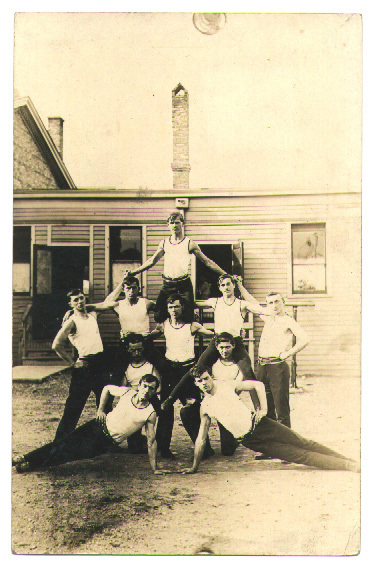 Watertown Gymnastic Troup - Real Photo Postcard, 1910's. During his early career Prof. Hardege was director of the musical department of the Turner Society. THE MEMORIES-----dances after the football games!! !